We are as anxious as you to have the first 2011 Explorers hit the lot at Waldorf Ford. Until they do, we thought we would share this article from Autoblog about their Dubai testing experience. 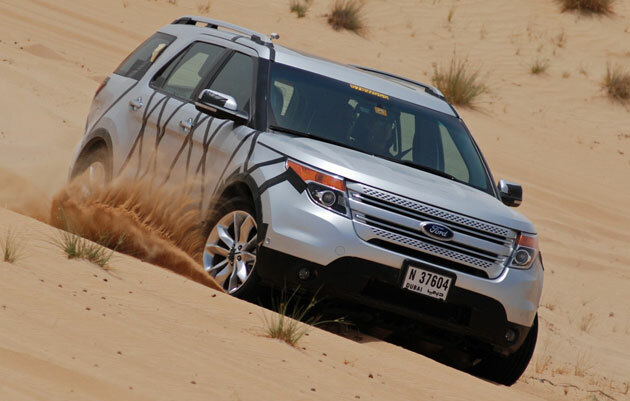 With California’s Death Valley conveniently located on the same continent as Dearborn, Michigan, why on earth would Ford ship engineers and the all-new 2011 Explorer all the way to the United Arab Emirates to conduct hot-weather and off-road testing? Especially on a crossover, a vehicle few people will ever drive off-road? The value of this 14,000-mile round trip became abundantly clear as I stepped out of the civilized, air-conditioned comfort of my shuttle vehicle, an F-150 SVT Raptor. The air in Dubai hits you like an atomic hair dryer. Unlike the heat in Death Valley, there’s some serious humidity hanging in the atmosphere due to the UAE’s proximity to the Gulf of Oman. Our day in the desert saw temperatures of 48° Celsius (118° Fahrenheit) with humidity in the range of 40-60 percent. That’s not a dry heat. Using a standard heat index calculator with a 50-percent humidity factor, the equivalent temperature showed 191° Fahrenheit.